For the last forty years, Prime Minister Ranil Wickremesinghe has been immersed in the murky waters of Lanka’s politics but each and every time he came up for air, it has been observed by all and sundry that he had surfaced unstained; and not a blob of mud clung to any part of his countenance. No wonder he had earned for himself the sobriquet ‘Mr. Clean’, the appellation granted willingly by the masses and grudgingly by his worst enemies. But even as he celebrated his fortieth political birthday three months ago, no doubt, he would have been perturbed to find that of late — about two and a half years ago — a hint of taint, a blot of black had suddenly sprung to occupy his visage. And that it was getting larger by the unholy day. Of course, he would have known how his virginal white had been despoiled and how the Joint Opposition had exploited the bond sent opportunity to tar him whole, even as they are tarred for what they did during the Rajapaksa regime’s years of mega corruption. Of course, he would know that it all stems from the Central Bank’s bond issue in February 2015 which exploded into scandal. He would also know that it was not hard evidence proving the Rajapaksa regime’s corruption but the public perception of its rampant existence that brought down the House of Rajapaksas. Not for nothing had he been in politics for forty years, many of it spent on the other side of the street, not to know the ways, wiles and means opposition members use to blacken the characters of those in power – how easy it is to create the smoke by setting alight the crackling leaves of gossip which spreads a faster than a wildfire. What a pity it had to happen so early in the morn of his premiership, when the cannon was filled with bond powder and sent rolling to the opposite camp to fire at will. With a note attached ‘Return to Sender’. With the benefit of hindsight, it is easy to cast doubts upon the prudence of the prime minister’s decision to import Singaporean citizen Arjuna Mahendran and make him, against the advice of President Sirisena, the Governor of the Central Bank. Just 16 days after Sirisena was elected president and Wickremesinghe was appointed prime minister. And who pray is Arjuna Mahendran? A Royal College old boy who had graduated from Balliol College, Oxford, he had served for ten years in the Central Bank from 1983 to 1991. Then served as the Managing Director and Chief Investment Strategist-Asia at HSBC Private Bank. He was responsible for research and analysis of markets in the Asia Pacific. He served as Chief Investment Officer-Wealth Management division at Emirates NBD. He then led the analytics team in interpreting market economics and developing investment strategies for HSBC’s clients in the region. From 2001 to 2004 – during the period Ranil Wickremesinghe was Prime Minister in President Chandrika Kumaratunga’s government — served as Chairman and Director-General of the Board of Investment of Sri Lanka. Thereafter, he served as Chief Economist & Strategist – Asia Pacific at Credit Suisse Group AG and was its Head of Research for Asia Pacific since October 2006. He became a Singapore citizen the same year. With such a CV, Ranil Wickremesinghe can hardly be faulted for making Mahendran — whom he had first met in 1991 and offered him a job in his Industries Ministry which was immediately accepted–the Government’s Banker in January 2015. After all, no crystal ball was in the prime minister’s possession or powers of clairvoyance hidden deep in his psyche to foretell what the future held when the fateful appointment was made. Little would the Prime Minster then have known that the bond scandal — like Pompeii’s volcanic Mount Vesuvius that had remained dormant for years and blew its top unannounced — would erupt within a month; and its spewing volcanic ash would threaten to bury the Government’s Yahapalana virtues in its fallout and blacken his own countenance, credibility and public image when it came to light that Central Bank Governor Mahendran’s son in law primary bond dealer Arjun Aloysius had made a cool profit of 5 billion from the bonds the Central Bank had offered for sale. And done so in questionable circumstances. As stated above, with the benefit of hindsight, it is easy to cast doubts upon the prudence of the prime minister’s decision to import Singaporean citizen Arjuna Mahendran and make him the Governor of the Central Bank in January 2015. What is less easy to fathom is why he chose to insist, in the latter part of June 2016, that Mahendran whose contract was to end on June 30th should be granted an extension for another year as Governor of the Central Bank. Why he was even prepared to cross swords with the President and risk the whole future of the coalition if his demand that Mahendran must be granted an extension was not met forthwith? And this at a time when serious allegations of possible insider dealings had risen, when accusations of possible collusion between Mahendran and his son in law were being levelled? This was the man, Mahendran, whose actions, wittingly or unwittingly had caused so much damage to the image of the Central Bank, whose tenure as Governor and his still undetermined role in the bond issue had brought the Government to disrepute, to the brink of infamy and threatened to plunge its Yahapalana doctrine to the sewers, not forgetting, of course, threw the Prime Minister’s own impeccable forty year record of unquestionable integrity into doubt. This was the man from Singapore, whose tenure at the Central Bank as its Governor had caused so much damage to the Government, who, despite it all, had the brazen impudence to ask the government for an extension of office. Fortunately, the President stepped into the breach and even took the unusual step to walk without warning to the Central Bank and there, in no uncertain terms, show the recalcitrant Mahendran the exit door. Mahendran packed his bags and flew back to his adopted Singapore but found the bond scandal had grown far too big and far too hot to handle to take in his baggage with him. Indeed, it had. More and more allegations were pouring in, more and more accusations of duplicity were being made and more and more secrets were coming to light that it became clear that the government’s Yahapalana image was itself under siege and its survival under threat. Luckily for the prime minister, the president’s decision not to extend Mahendran’s contract after June 30th 2016, spared him the blush of embarrassment that would undoubtedly have brushed his cheeks when four months later the parliamentary Committee on Public Enterprises (COPE) issued its final report on the investigation into the Central Bank bond controversy. It held former Central Bank Governor Arjuna Mahendran directly responsible for the questionable transaction and called for legal action. It said there was evidence which gives credence to the allegation that Mr. Mahendran interfered and influenced the process. The report consisted of 55 pages supported by 2000 annexes and was presented to Parliament and its recommendations were unanimously approved by all its 26 members, UNP members included. b) called for legal investigations and stressed the need for Parliament to monitor the follow- up action by law enforcement agencies and carry out progress reviews. Imagine what the political fallout would have been if Mahendran still warmed his bottom on the Central Bank Governor’s chair courtesy of the Prime Minister’s demand that he should be granted an extension? Wouldn’t the public have wondered why the man whom the all party COPE had damned and held directly responsible for the questionable bond transaction and against whom it had recommended legal action, still held roost in that supreme monetary office, hatching the eggs the public goose laid with the power to determine its value? And wouldn’t they have been perturbed to also know that his continued occupation was because the PM had insisted upon him remaining, in spite of the storms that had lashed against his extension end June? Why, instead of a terse GROBR — or Good Riddance Of Bad Rubbish — the PM had chosen to plead with the president and insist upon an extension on the swampy ground the Singapore citizen was indispensable to spur Sri Lanka’s economic sun to rise in the morrow? The gods indeed had saved Sri Lanka’s statesman son from political disaster and sent their human instrument, Sirisena, to veer him back to course. According to the Auditor General, the scam had resulted in the country losing Rs. 1.6 billion, while primary dealer of Central Bank, Perpetual Treasuries Limited, owned by Mahendran’s son-in-law Arjun Aloysius, had recorded a profit of Rs. 5 billion for the year that ended in March 2016, an increase of 430% in profits in comparison from the previous year. On January 25 this year, President Sirisena announced his intention to appoint a Presidential Commission to inquire into the Central Bank bond. He said it was to give the utmost punishment to those who are guilty of offences. In a tweet on January 27th, Sirisena said, “I will appoint a Special Presidential Commission of Inquiry this week to investigate the Central Bank bond issue and recommend actions.” He announced the composition of the three-member commission: Supreme Court Judge Kankani Tantri Chitrasiri, Supreme Court Judge Prasanna Sujeewa Jayawardena and retired deputy Auditor General Velupillai Kandasamy. The Presidential Commission got down to business proper on February 21 this year. And now eight months later, it announced this week on Tuesday that it had concluded its sittings for the time being. The presidential mandate is set to expire next Friday October 27. In the meantime, it has requested the President to extend the time frame till the end of the year to tie up any loose ends. It had sat for 120 days and it had been a remarkable marathon performance by the Commissioners and by counsel in the Attorney General’s Department and by the counsel who appeared to protect the interests of witnesses summoned. To all of them the nation must owe its thanks. And it had provided entertainment for the masses and given them an insight into the workings of the financial citadel and how, in that secret conclave the nation’s monetary credibility was sold or bartered, manipulated to serve the interests of money marauders or protected against the lances drawn in attack by primary dealers. 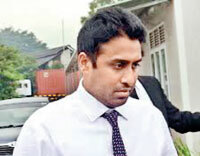 And some of the witnesses summoned to testify fell victim at the Commission’s altar, a notable instance being the former Finance Minister and then Foreign Minister Ravi Karunanayake who was forced to resign and make his swan song in Parliament a week later not because of any direct involvement in the bond scam per se but due to his professed ignorance that Arjun Mahendran’s son-in-law, Arjun Aloysius was paying his monthly Rs. 1.4 million rent to keep him and his family nested in the penthouse suite at the top notch Monarch Residencies. The Hamlet of the play, primary bond dealer, Mahendran’s son-in-law, Arjun Aloysius when summoned by the Commission refused to testify at all pleading the Commission had no power to compel him to do so, which legal position was correctly accepted by the courts, even though his silence that speaks volumes may resound in some other court of law. His wife Anjalie’s father, the former Governor of the Central Bank Arjuna Mahendran, however, did not resort to legal protection and opt to remain silent. For a whole week and more he subjected himself to the Attorney Generals’ representatives hostile questioning. And that was to his credit, that he did not run away and seek the shelter of legal cover but took the stand to face the music, come what may. Amongst those who took the witness dock were former Chairman on COPE and former Minister DEW Gunasekara and the Auditor General. Ministers Malik Samarawickrama and Kabir Hashim made their cameo appearances and, as is the fashion and tradition of cameo appearance did not spend more than ten minutes each on stage before they made their exit. It was one of those “blink and you miss them” appearances. Then there was the devastating testimony of the Chairmen of the Bank of Ceylon, the People’s Bank and the National Saving Bank who stated that the then Finance Minister Ravi Karunanayake had ordered them to place their bond bids at a lower level which would effectively rule the three banks out of the running and leave the field open to others with their higher level bids. No prizes for guessing right who benefitted from it. And of course, there was some hilarity, too, to enliven the commission’s proceedings when the personal assistant to Arjun Aloysius, a certain Mr. Samuels who said he had been a cabin crew member of some Middle East airline for the last twenty five years before he arrived at his present destination at Aloysius’s office and was appointed as his Man Friday. When questioned as to the text messages he had sent to his boss Aloysius which names a mysterious RK, a certain A. Mahendran and a familiar Hon. PM. A titter ran through the quasi judicial court room when all — commissioners, counsel, journalists and spectators alike — heard his profoundly ignorant replies. As the personal assistant of the now new billionaire Aloysius, Samuel did not know who RK — whom he had referred to in his text message to Aloysius — was. Je thought A. Mahendran was Anjalie Mahendran, the daughter of Arjuna Mahendran and the wife of his boss Arjun Aloysius. And to cap it all he had no clue as to the identity of Hon. PM he had referred to in SMS to Aloysius and didn’t have the foggiest what the abbreviation Hon. meant. The answers so moved the Supreme Court judge Jayawardena to tell Samuel’s lawyer “Bring Samuel here one day to educate us also on how to forget things, it’s a remarkable talent”. President Sirisena’s decision to appoint a Commission of inquiry with two Supreme Court judges and a retired Deputy Auditor General on the bench is indeed admirable and commendable. It enforces his commitment to Yahapalana principles of transparency and accountability. Corruption can take place under any system. It happens in the land where the Mother of all Parliaments, Westminster holds sway. It happens in the United States constitutionally dedicated to the principles of democracy. And certainly it happens in Lanka, where today Yahapalanaya – democracy by another name – rules ok. It’s how the system reacts to corruption that determines a state’s true political nature and not the avowals profusely made by its leaders on political platforms. Under the Rajapaksa regime an inquiry into their own ministers, their own cronies would have been unthinkable, even as lawyers from the Attorney General’s Department cross examining witnesses, even senior ministers of the government, sans fear or favour, would have been far too frightening to even contemplate. None would have dared to cross the line to behold the realm of the dead. All good things must come to an end. And though the Presidential Commission into the bond inquiry had brought to light many a thing and provided much entertainment to the spectators, a time arrives when it must call it a day and provide a report of its findings to the President for further action. But wait. Isn’t there one vital witness waiting in the wings to be summoned to the stage to render his soliloquy, who is willing to be questioned on his monologue in order to clear his good name and to lay at rest all the canards, the calumnies hurled at him? The man whose decision to appoint Mahendran as Central Bank Governor set the ball rolling in the first place? Enter four times Prime Minister Ranil Wickremesinghe with his reputation for honesty, integrity and incorruptibility preceding him even before he steps on to the stage. For reasons best known to him alone, he appointed Mahendran as Governor of the Central Bank in January 2015 and decided to promote his extension in June 2016. As details of the bond scandal broke loose and the canards swirled and sucked him into the vortex of controversy, Ranil Wickremesinghe kept his cool, maintained his composure; and, to the manor born, remained studiously silent when the winds of blame howled around him. His strength was the strength of ten for his heart was pure and his moral rectitude was beyond question. Unlike today’s riffraff politicos, it’s not in Ranil’s nature to answer to the gallery that which must be answered to the gods and addressed to his conscience. But he was and is a politician; and his bread, butter and power comes from the masses. With one exception. Unlike the run of the mill politicians, Ranil Wickremesinghe is a statesman. Perhaps, the only living Lankan statesman in the land today. When accusations of any possible involvement with the bond scam were liberally touted by his foes, he remained calm. It was not in his ‘getup’ to issue statement after statement denying involvement. That would not only be cheap but that would not convince anyone of his innocence, his genuineness. As Anura Bandaranaike stated, “he decides at the correct time and that is a potent factor in arriving at proper decisions.’ Thus Ranil chose to bide his time, stay aloof from opposition brays for his blood. He would choose the moment to make reply, to answer, point by point, the allegations leveled against him in gossips’ grapevine. And when the President announced the establishment of a Commission to inquire into the Bond Scam, no doubt, he would have decided it to be the best legal forum in which to clarify any doubts the public may have and clear his good name in the electorate’s eyes and erase the black acne on his face he had endured to bear without complaint or excuses rendered for the last two and a half years. He had bided his time, watched with patient resolve the proceedings of the commission unroll, and then, when it reached its crescendo and still no cue came from the Commissioners to invite him on stage to deliver his side of the story, he decided to stage crash, just before the curtain dropped on the proceedings. And what was the response from the Commission? They issued a question paper for the Prime Minister to answer by way of an affidavit within a reasonable period of time. Good. But would that be enough to lend credence? No. Thankfully for Ranil, the Acting Attorney General Dappula De Livera insisted that a mere affidavit would not suffice and that the Prime Minister must be called to take his place on the witness stand because he also had some other questions to ask from the Prime Minister apart from the questions put forward by the Commission. He further said: “I think for the team the job is not over, the task is still outstanding and as far as this Commission is concerned our job is still not over. In terms of the evidence that transpired during the proceedings, we have submitted a list of 20 witnesses to the Commission dated October 10, 2017 and out of that 20, only some of the witnesses have now testified before the Commission. But still having considered the material we had gathered so far from the interviews with witnesses, these listed witnesses are necessary. The Prime Minister is also listed as a material witness”. The Prime Minister would have welcomed with applause De Livera’s insistence that he makes a personal appearance and be subjected to Livera and his team’s questioning. Ranil Wickremesinghe would know that to win back his credibility and to wipe out the tar on his visage he perforce must run through the gauntlet of a ring of fire and prove his innocence by emerging unscorched. PS: For those who doubt its existence, this is Yahapalanaya or Democracy in action. In the Rajapaksa regime days would the then Acting Attorney General or any lawyer in that department even dare seek to question a two bit minister or even a third degree one like Mervyn de Silva? There would not have been a Bond Commission, in the first place. Think about it.